Home > Health & Wellness > Supplements > CBD Holistic Hound Hemp & Mushroom Chicken Dog Treats 7.5mg. 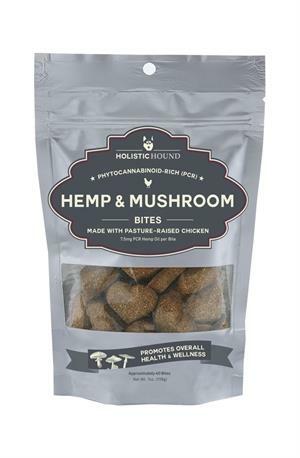 CBD Holistic Hound Hemp & Mushroom Chicken Dog Treats 7.5mg. Many pet owners use hemp products for conditions diagnosed by their veterinarian, with the most common being cancer, seizures, anxiety, and arthritis. They also reported that these products were moderate to very helpful in improving their pet’s well-being and that they had a positive impact in relieving pain and anxiety, as well as helping with sleep. Side effects reported were minimal: sedation and possibly an increased appetite. Holistic Hound CBD treats are great for medium, large and large-breed dogs. Inside all mammals is an intricate network of receptors that play important roles in health, healing, and overall wellbeing. The endocannabinoid system (ECS) was discovered in the early 1990s, but evolutionary evidence indicates that some version of this system has existed in all vertebrates for at least 600 million years, suggesting that these receptors and the substances that bind to them play a crucial role in the functioning of life. Chickpeas, organic pasture raised chicken, pea flour, organic coconut oil, organic carrots, organic sweet potato, organic mushroom powder, CBD rich hemp oil. Because CBD rich hemp oil is non psychoactive, you can be comfortable in giving less or more as needed to achieve balance.